This month I was assigned Shockingly Delicious, a wonderful blog full of scrumptious, budget-conscious, healthy, family-friendly foods + decided to make these Vegan Falafel Burgers. And y’all, I don’t think I can adequately explain how amazing these were. SO fantastic. They are simple to prepare, but packed with complex, impressive flavor. After making these for dinner recently, my husband told me that, honestly, he hadn’t had terribly high expectations for these burgers (as he’s not a huge meatless meal lover), but his mind was blown by their deliciousness. He actually said, “I do not miss the meat one bit – these are AMAZING. Can we please have these again within a few weeks?” You bet we can! I like serving them in pita pockets with lettuce, tomato, cucumber, onion, and a little tzatiki sauce. Perfection! 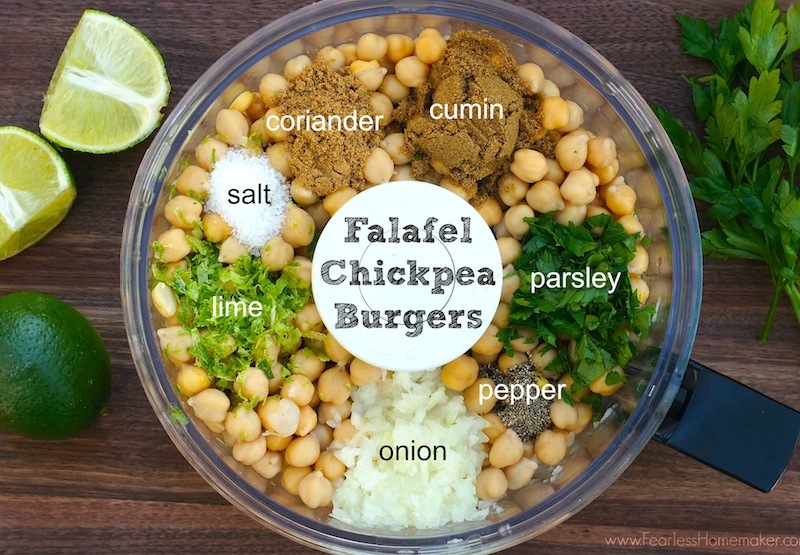 Thank you to Dorothy for introducing me to these truly fabulous falafel burgers + to the Secret Recipe Club for connecting me, yet again, with fantastic bloggers + amazing recipes! For all my previous Secret Recipe Club recipes, click here – there are TONS of awesome ones! Put the chickpeas, onion, lime juice and rind, coriander, cumin, parsley, 1/4 cup breadcrumbs, salt, + pepper into a food processor and process to a coarse paste. Spread out the flour on a large, flat plate and turn the patties in it to coat. Heat the oil in a large skillet (just enough to lightly cover the bottom of the skillet), add the patties, and cook for 5 minutes on each side, until crisp. Amy, how funny that we had each other’s blogs this month! 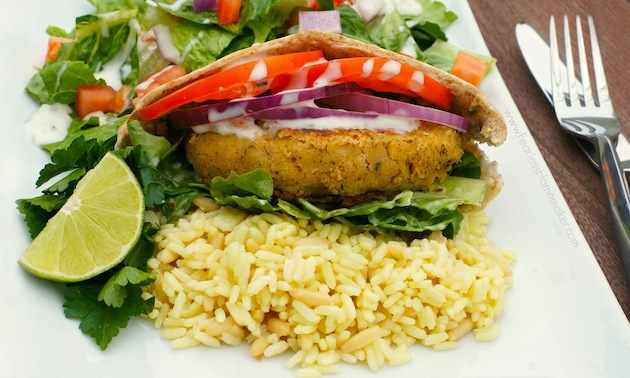 You did a fabulous job on the falafel burgers. They’re so good looking! I might have to make them again this week, due to your post! Great meeting you through SRC! Such a delicious lunch or dinner! And so healthy! Hubby surprised me with a dinner of homemade falafels,homemade pita and tzatziki last week. I love the idea of making them burger size. I will be pinning this recipe and trying it soon! Putting this on the list for a meatless Monday meal. Thanks. i am definitely trying these soon! i love falafel. Isn’t Dorothy’s blog wonderful? I have never made falafel before. In fact, I’ve never had it before. This is definitely going on my must try list. We aren’t vegetarian, but I have a veggie burger recipe that I absolutely adore. I think I’d love this one too! Putting it on my list to try. For anyone else who’s interested, here are the vegetarian quinoa/black bean burgers that Beth mentioned -http://ofmusesandmeringues.blogspot.com/2013/08/camp-friends.html – I’m going to be trying those soon! Falafels make up 80% of my vegetarian life haha so I would love to try your delicious burgers 😀 They look so wholesome! These looks so good! We make a very similar version in the summer and love them. Oh my goodness that looks incredible. 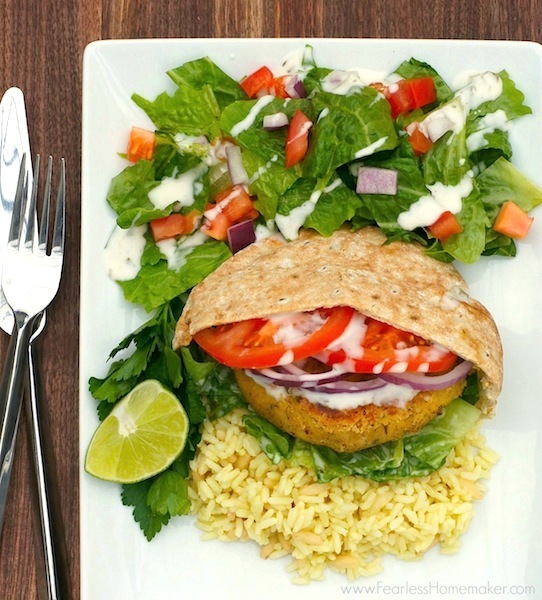 I’ve had falafel burger on my list of things to make and here it is! That entire plate looks wonderful. Yum – Amy, these look seriously delicious and I know I would absolutely love these. Great pick this month. and you say its healthy too. Wow, these sound AWESOME!! I LOOOOVE falafal, and making it into burgers is genius! I so love this! I’m a big fan of burgers, especially healthy ones! This one looks extremely yummy and easy to make :D!! Hello….I love falafels! It wasn’t until I went to Israel that I started tasting real delicious falafels. Then I thought to myself, why had I not made this before? Thanks for sharing this recipe. Your falafel looks like the ones I had in Jerusalem, Tel Aviv and Akko. Lots of fresh greens and a bit of tahini on top! Delish! I love falafel but they never turn out right. I should try to make burgers! Such a beautiful plate. I’ve never had falafel but this looks amazing. Definitely saving this for later. Do you know how they compare to restaurant falafels? I love falafel, but the ones I’ve made at home weren’t better than the falafels at the takeout gyro place, so I stopped bothering. Hi Lesley! My husband + I both agreed that we like these *better* than our local Greek takeout falafels. (Chicago Style, the same place that’s in the Farmer’s Market, has a brick-and-mortar location near us). That being said, their falafels are not great. =| Since these are pan-fried and not deep-fried, they aren’t quite as crunchy as restaurant falafels. They have a more moist interior (I often find restaurant falafel to be too dry for my taste), and a slightly crisp exterior. Perhaps more dense than restaurant ones, but less toothy? The texture actually is somewhat similar to a turkey burger in that way, although I know that doesn’t help you!